Life is still good in Texas for my family, which of course includes our dogs, Summer the cat, and the latest addition to our brood, Patrick and Taffy the Guinea Pigs. 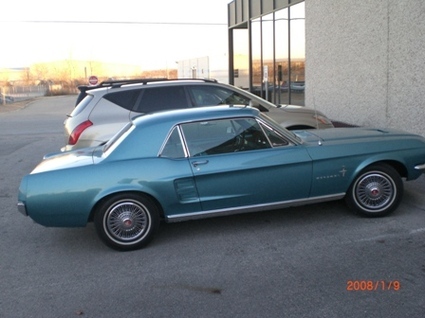 Oh, and I acquired yet another automobile. Here's some pics of the animals. 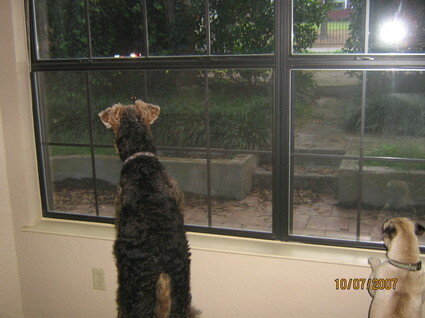 Eagle and Ranger on cat watch .. if you look carefully you can see the cat's glowing eyes in some of the foliage outside the window (right above Ranger's right ear, almost touching it). 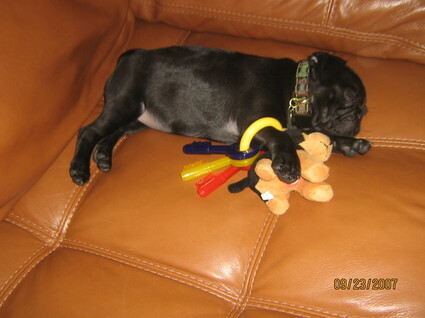 Eagle with one of the sushi toys that I keep buying for them. 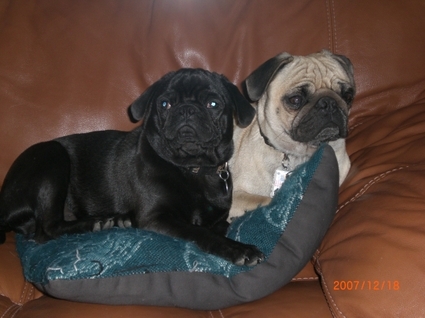 I don't know what it is about this pillow and why they both insist on laying on it or taking a nap on it together .. 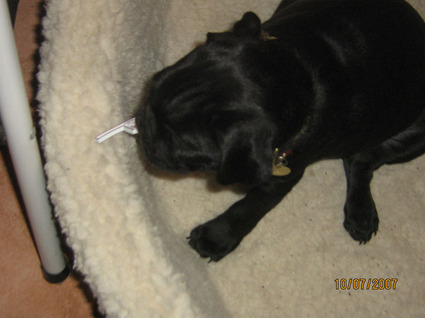 Caught in the act of pug naughtiness! 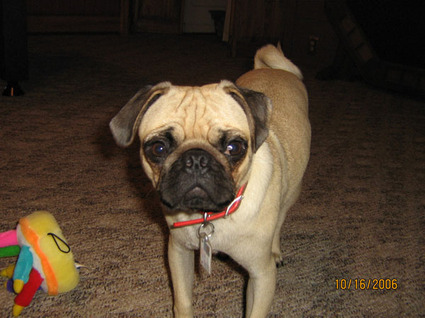 Because I had to take the pugs to Pug-O-Ween this year without an assistant, I wasn't able to get any pictures of them in their costumes as I was too busy just trying to keep them from running wild. 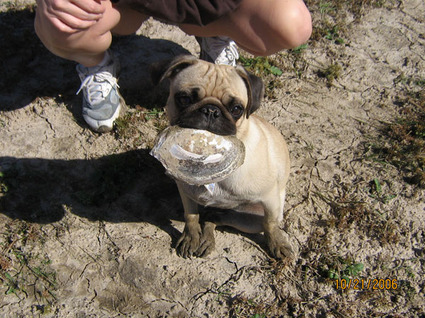 Finally, however, a picture that the DFW Pugs Rescue Group took has been posted on their web page. 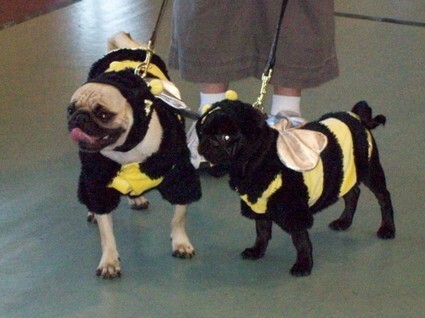 How cute were my little bumble bees? PS On a side note, I am now officially a Private Pilot. I passed my check ride and was issued my Airman Certificate on November 16th. Hooray! 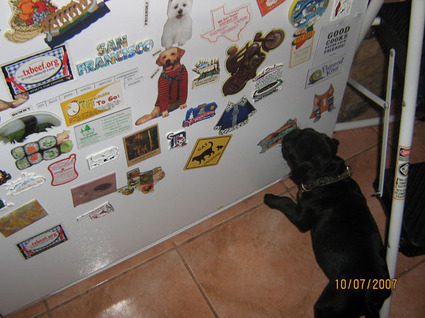 At first I was ready to blame Ranger for the recent increase of refrigerator magnets ending up on the kitchen floor with teeth marks in them. After a thorough investigation, which included catching the culprit in the act, I have determined that Flyer is behind this naughty deed. I am not sure what message he was trying to send by targeting the Oklahoma magnet. 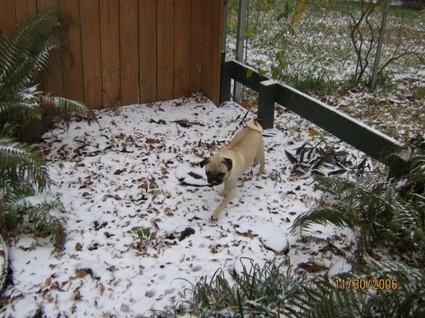 Perhaps it's a message to Ranger (born in Oklahoma) from a Pug that is native Texan. 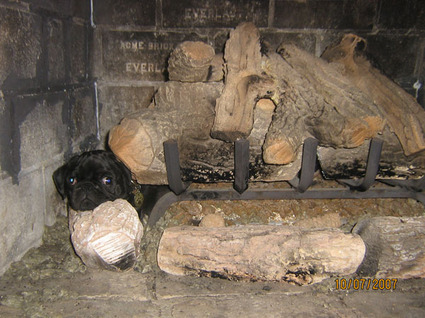 The other thing that the black Pug puppy seems to insist on doing is crawling into the gas fireplace and taking a nap. He's been reprimanded at least a dozen times for doing it, but I still catch him in there. 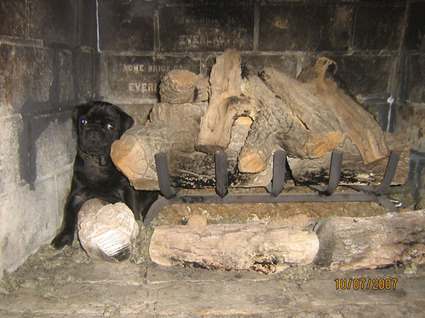 I am going to have to put the fireplace screen up again, I think. He does look cute, though. ... dogs in the house, now, that is. 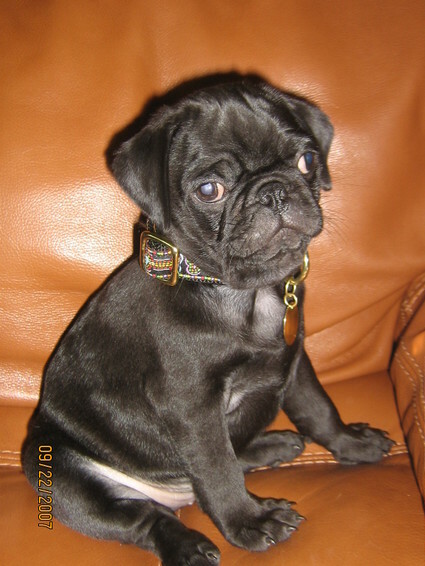 Yes, after reading about the introduction of little Wendell into the life of Ayatollah Mugsy, I finally put my nose to the grindstone and tracked down a little black male Pug puppy of our own to bring home. 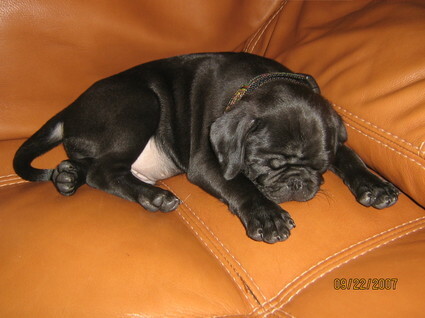 After much negotiation with my husband, I was able to convince him that the puppy should be named Flyer (not Cowboy as he had told me I had to name him if I was going to bring another Pug into the house). 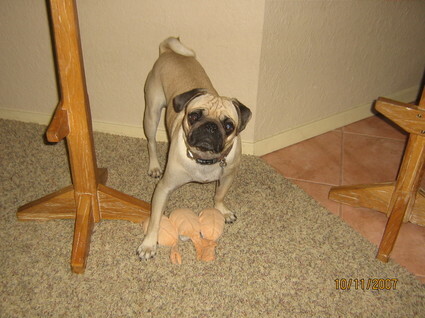 He's a very sweet natured boy; we're enjoying having him as part of our family. 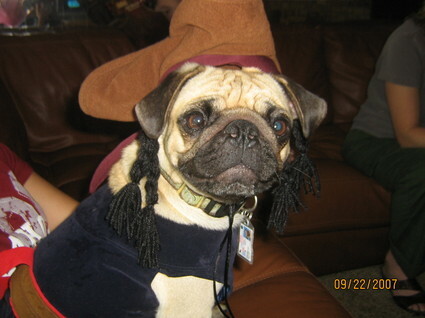 We also did a test run on a costume for Eagle to wear for pug-o-ween. 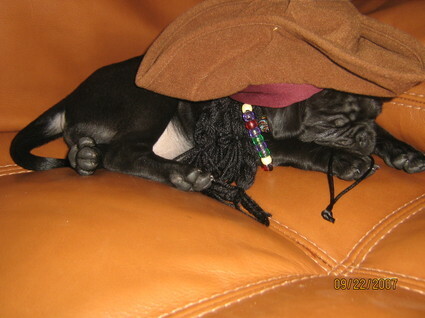 This one is Pirates of the Caribbean themed. 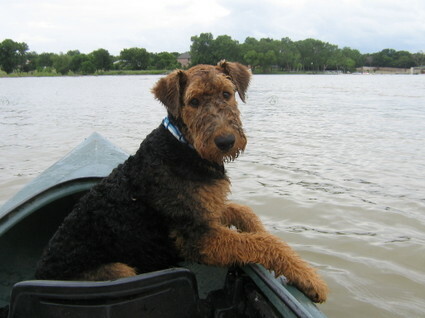 I'm looking for ideas to incorporate a crazy acting Airedale and an uncooperative Pug puppy into the mix, however. Things have been hectically busy around our household. 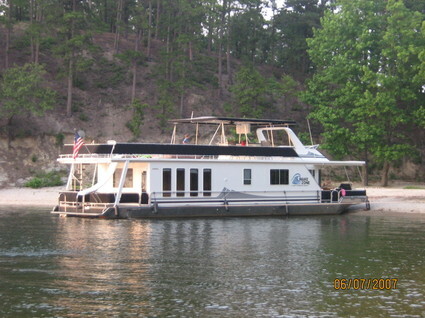 Last week we went on our family vacation to Crystal Springs, AR where we rented a houseboat and basically did nothing significant other then relax the entire week. Well, to be honest, we did swim, fish, jet ski, play games, and just enjoyed having no agenda for a few days. 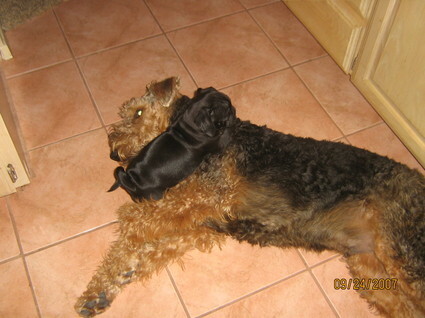 The pups, on the other hand, have been VERY busy enjoying their summer immensely. 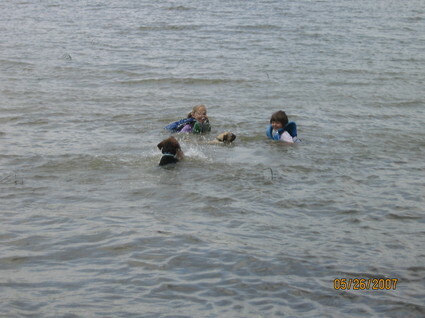 With all of the rain we've had in Texas, the lake is back up to our dock and the Pug/Airedale aquatic team is really enjoying the water activities. 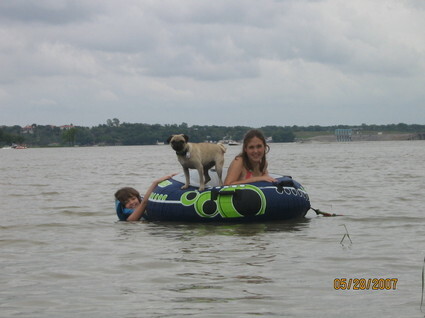 We can't keep them out of the lake or the pool! 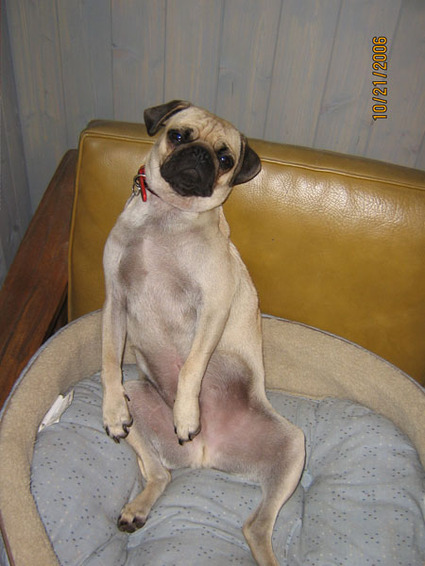 What's Up With The Pug? We've been so crazy busy lately that I've really neglected updating this blog as often as I'd like to. The holidays flew by, and now here it is, Valentine's Day already. Here are a couple of pics from Eagle from last fall, the first is him working out on the doggie obstacle course at Fort Woof. The second is Eagle enjoying some of the sporadic and very little snow that we've gotten a few times over the course of the winter. Eagle had a full social calendar this past weekend. 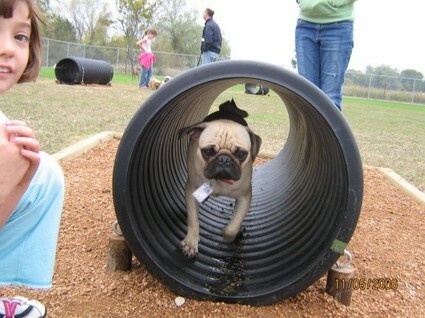 On Saturday, we ventured to Fort Woof Dog Park to attend Barktoberfest. It was fun to walk among a few hundred other dog lovers and their canine pals. Eagle enjoyed the fact that we brought home various free samplings of dog treats and food for him to try. Sunday, however, was the highlight of his weekend. 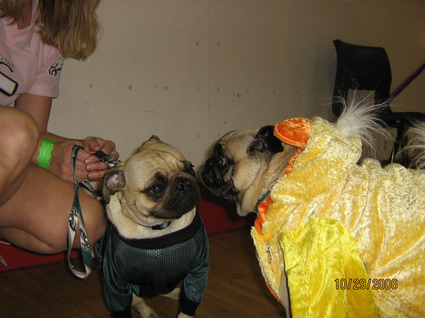 We took a little road trip to Arlington to attend Pug-O-Ween which was to benefit the DFW Pug Rescue group. 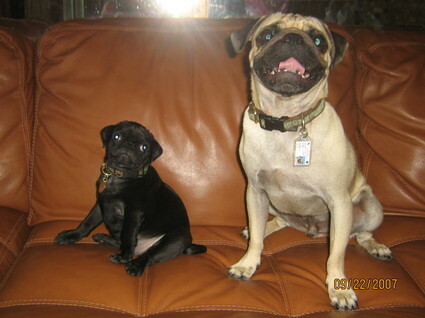 It was interesting to learn that their group is the second largest Pug Rescue group in the country. Although Eagle couldn't be persuaded to wear his Yoda costume, I did manage to get him into his Eagles jersey for the event. 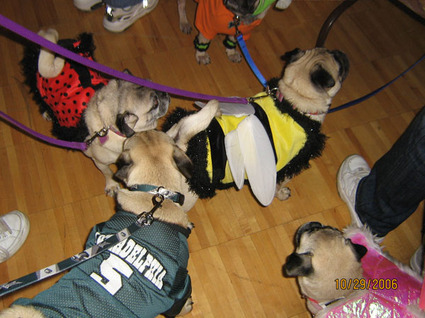 It was enjoyable to watch the various costumed pugs strut their stuff. 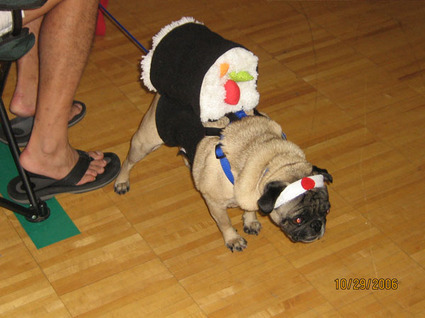 Our favorite costumed pug was the Sushi Pug. The most frightening costumed pug we saw wasn't Bride of Puggenstein, or even Count Pugula for that matter. 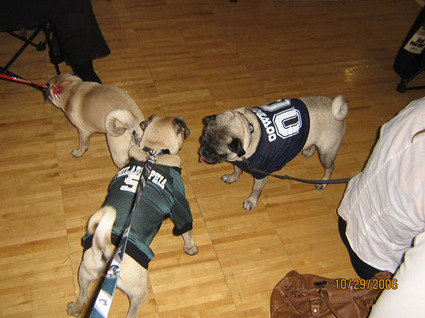 It was .. Dallas Cowboys Fan PUG !! Eagle seemed to have a good time mixing and mingling with all of the pugs he encountered. 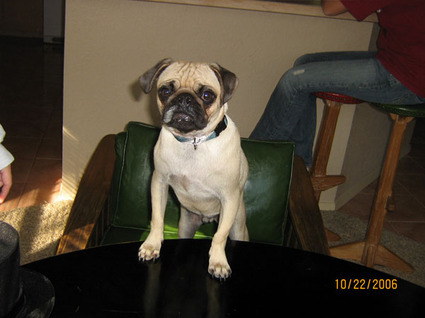 However, without a doubt, the most exciting encounter for him was when he was able to rub smooshed noses with his spiritual leader and mentor, the great Ayatollah Mugsy. It was very clever of the Ayatollah to go undercover as a pugly duckling to avoid any kind of pug stampede upon realizing that his Greatness was among them. 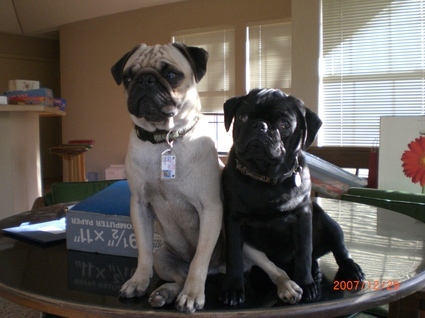 I'm not sure what the two of them discussed during their meeting, but I'd venture to guess it involved laying the groundwork for the creation of a sovereign pug nation. 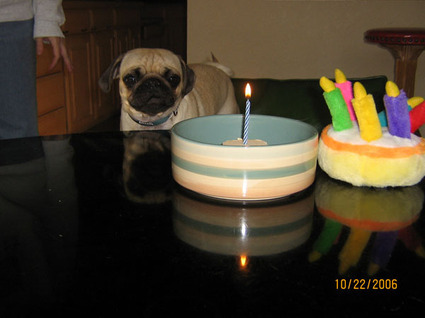 We waited until the weekend to throw Eagle a little birthday party. 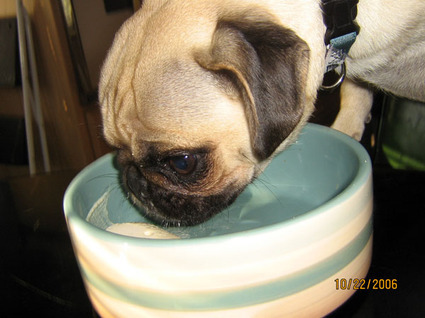 While the rest of us enjoyed some chocolate cake, he was treated to a bowl of doggie ice cream . 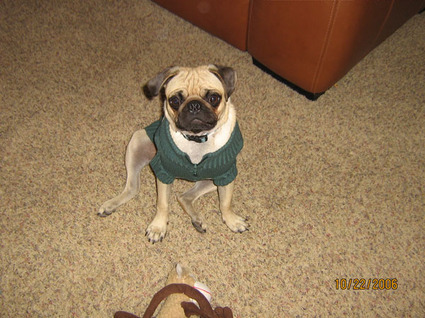 One of this birthday presents was a new sweater for those chilly Texas mornings. I don't think he's that enthralled by it, but that doesn't matter because he looks so cute in it! Most weekends seem to revolve around entertaining Eagle. 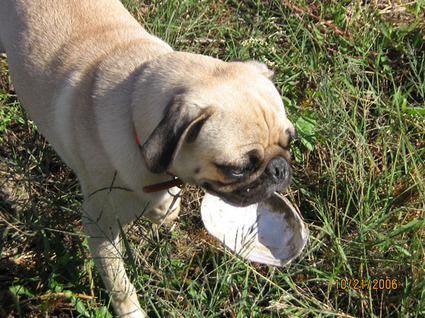 A couple of weekends ago we took another trip down to the lake, where Eagle has become enamoured with "capturing" empty clam shells and running around with them in his mouth. 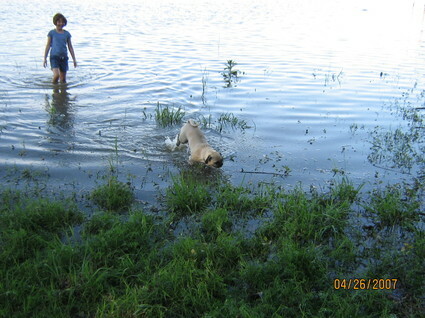 Of course it's still warm enough (at least for him) to go for a quick dip in the lake. 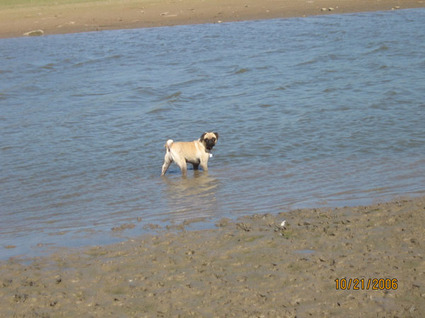 A result of all of the lake wading and clam digging is a muddy pug. Which leads to the unfortunate activity of being made to take a bath. 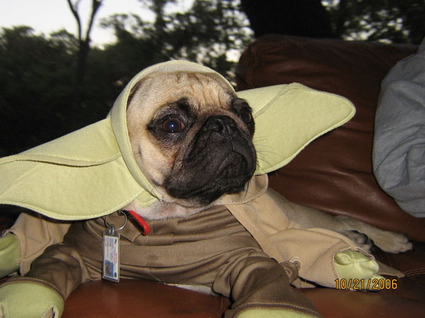 Now that he's worn out, we try on the Yoda costume once again. 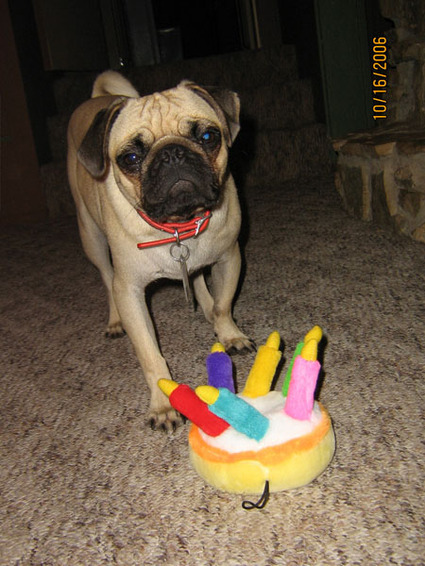 Today is Eagle's First Birthday. 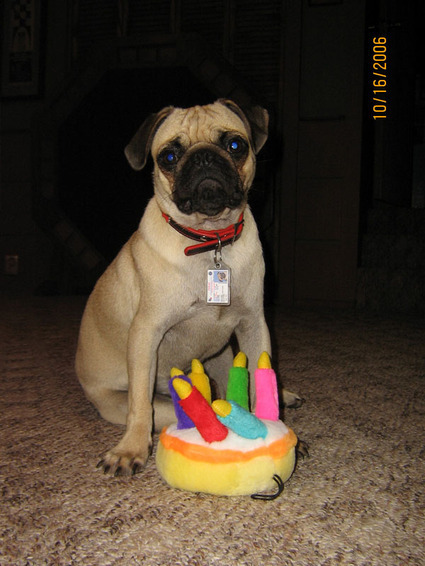 As part of his birthday celebration, he went to Doggie Day Camp for the day so he could play with his friends there. 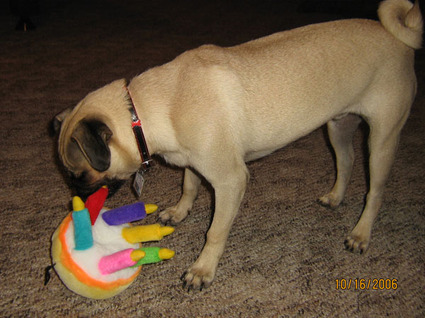 On the way home, we stopped at PetSmart and picked up a birthday appropriate toy. 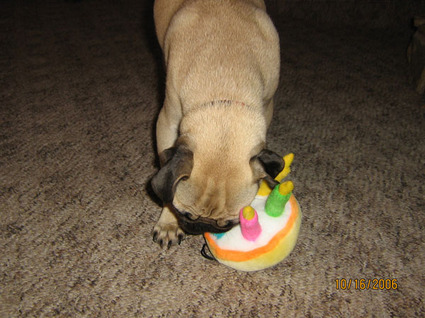 When he bites it, it plays the birthday song. And tonight .. well .. tonight there will be doggie ice cream for dessert!